Widely regarded as one of the great 20th Century plays, Long Dayâ€™s Journey into night is a powerful story leaving you coming away from it knowing that youâ€™ve watched a family in insolubale turmoil. Key negative events and bad choices in the family history have led to compounding the knock-on effects of negative habits that the family just cannot break. They try to show each other love and support but then their own unresolved problems overwhelm them so much that they are only capable of thinking about themselves. This is a story which for some families is sadly all too true and is semi-auto-biographical; so much so that the author gave instructions for the play not to be performed until twenty five years after his own death (a wish which not acted upon)! This is about a well-to-do family, but the extremes of human nature that got them to the top also have the ability to destroy them. Although they are rich, now there is a backdrop of terrible grinding poverty. The patriarch who grew up in penury is now rich but thinks like a poor man. The decisions he makes for his family are usually done on the cheap and this has had serious damaging effects on his family. The impressive set is perfect for this very full and frank exploration of a rich dysfunctional Irish American family that have made it to the top of American society, ably demonstrating the depth and height of the large stage area as we see right inside a large, three-storey house (although the extensive use of clear polythene sheeting appears neither necessary nor in keeping with the period). The story is set around 1912 but could easily be a tale of today; a drug-dependent mother creating a co dependence with her youngest son; a miserly father, sibling jealousies, escapism through alcohol and drugs and ignoring the problems by denial. Yes it is bleak but if you like reality in your art, then this will connect. Dominic Hillâ€™s direction ensures the pace never slackens and imaginative lighting really enhance the changing moods in the play. George Costigan gives a powerful performance as the father, James Tyrone, and Brid Ni Neachtain is superb as his wife Mary, trying to make sense of what she had and has in this very complex family situation. Sam Phillip brings real angst as the elder son James Jnr. who has not met the expectations placed on him. Special mention must be made of Lorn Macdonald who as the younger son Edmund Tyrone, presents an excellent portrait of a young boy struggling with both domestic issues and serious illness. Long Dayâ€™s Journey into night is three hours long and was probably not written with an audience much in mind, although the length is there for a purpose - to fully explore why each character thinks and acts as they do. A little bit of tragic humour continuously seeps through, but it is nonetheless so honest it cannot fail to resonate with an audience. 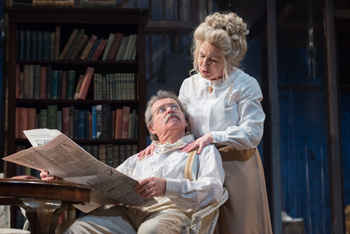 A powerful play, excellently performed, Long Dayâ€™s Journey into night is on on until 26th May.